ARCATA – Nuns in drag. Good. Playing softball. Better. For the Arcata Community and Sunny Brae forests. Best. And it won’t just be nuns – everyday citizens, “notables” and name-brand politicos will be part of what might be the most mascara-rich environmental effort/sporting event ever, Friday, Sept. 10 at 6:30 p.m. at the Arcata Ball Park. History may record the event as another significant step in Arcata’s environmental progress. Monies raised add to a non-governmental fund administered by the Humboldt Area Foundation, which will be the local buy-in to help bring in much larger grants. The fund has been championed by Mayor Alex Stillman as a way for citizens to help expand Arcata’s community forests and even to offset their carbon footprint. Donations may be made online. Contact HAF at (707) 442-2993 and hafoundation.org. Stillman and others have been meeting informally on Mondays at Sunny Brae’s Coffee Break as the Arcata Forest Fund Committee. Other participants are Third District Supervisor Mark Lovelace, Environmental Services Director Mark Andre and activist Debi Farber-Bush. A number of parcels outside the City-owned forests must be acquired in order to make the multi-modal trail. Among them are 16 acres presently owned by Green Diamond Resource Co. Acquisition of that parcel would make possible a long-cherished link from the Community Forest to West End Road via the recently established conservation easement through the Samuels Property. “We’ve got a historic opportunity here with Green Diamond,” Andre said. Much of the funding is already secured, but another $40,000 is needed to seal the deal. Other parcels open for City acquisition include the 25.5 acre Stromberg property and the five-acre Humphry Property. The southern trailhead would be on Margaret Lane by the City water tank. The trail would process through the Sunny Brae Forest and onto the eastern leg of an oddly-shaped 22 acre parcel presently owned by George Schmidbauer. That property, along with another 110-acre parcel known as the Morris Property, would be funded through state grants and acquired as a package deal. While the Morris Property isn’t part of the trail, it would become part of the Sunny Brae Forest and offer fresh access to it from Fickle Hill Road, simplifying management and allowing several distressed old logging roads to be “put to bed” – that is, recontoured and revegetated. Funding for Morris and Schmidbauer is also being pursued via grants. The fundraising model is shaping up as similar to what was done successfully with the Sunny Brae-Arcata Neighborhood Association (SANA). That citizen group successfully raised some $100,000 for purchase of 175 acres from Sierra-Pacific Industries in 2006 to create the Sunny Brae Forest. A like amount is needed to gain the Green Diamond, Stromberg and Humphry properties. Once acquired, further grant funding could be applied for to build the proposed trail. 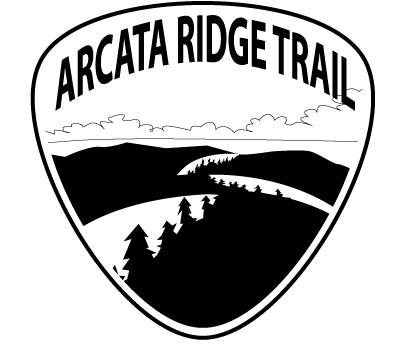 Artist Dave Held has drafted these possible Arcata Ridge Trail logos. The next iteration will include bicycle and equine users. “We don’t expect it all to come from the community,” Andre said. But community participation is a force-multiplier, helping grant administrators justify investing in them. “Every $10,000 to $20,000 we raise can be multiplied by tenfold to twentyfold,” Andre said. Local forest users will enjoy the expanded recreational opportunities, as well as an off-road commute route linking Valley West with Sunny Brae. The new trail would help alleviate pressure on current trail routes in City-owned forests, which are heavily used. The package of acquisitions would also allow the Forest Management Committee and City to manage the forested areas east of town in a holistic, integrated fashion, providing permanent protection of open space, timber resources and watershed values, wildlife habitat, corridors and access for recreation. Andre sees further benefits to what could be even more eco-tourism appeal for Arcata, which already draws visitors who use the forest as well as the Arcata Marsh and Wildlife Sanctuary. 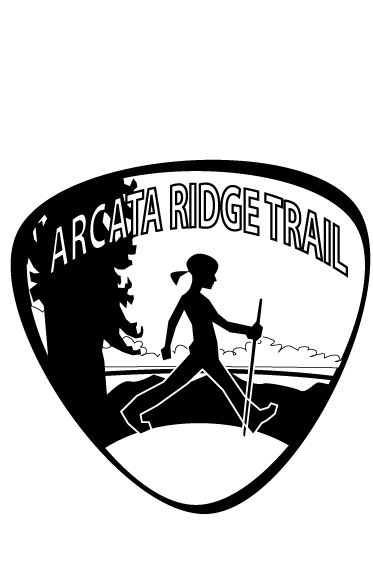 Artist Dave Held is creating possible Arcata Ridge Trail logos for use in fundraising activities. Bat N’ Rouge is a wacky softball game with all the bells and whistles of a conventional softball game including Pom Pom Queens (the PPQs). The rules have been waived, cheating is a great thing, and home runs can be purchased. 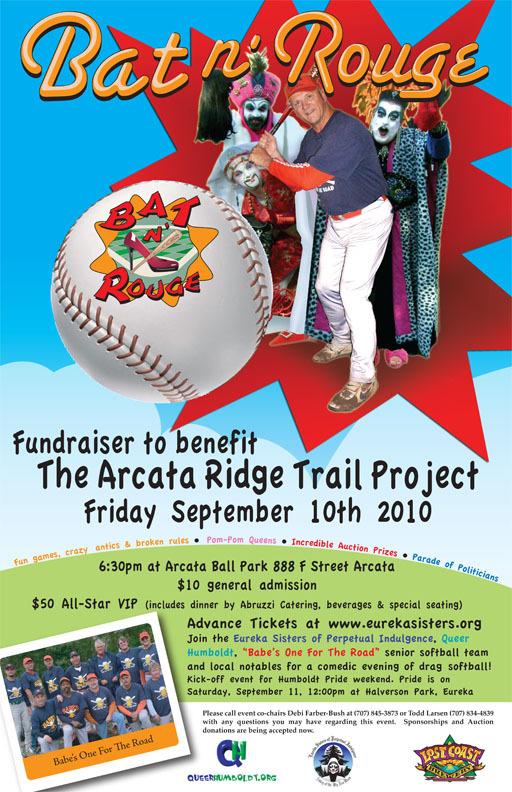 The entire game is professionally choreographed by the Eureka Sisters of Perpetual Indulgence with music and traditional ball game sound effects. Community members, “Notables”, and “Politicos” are very excited to change from their traditional clothing into “drag garb” and batter-up, all while raising money for a great cause. In addition to softball, there will be major audience participation. Food and beer will be available for purchase and a special All-Star VIP section will be offered in the picnic area where attendees with All-Star VIP tickets will be wined and dined in a more exclusive manner. A live auction during “HALF TIME” will occur with approximately 10 large items auctioned off along with a special “Parade of Politicians” (politicos in the November Humboldt County Run-Off). Call event co-chairs Debi Farber-Bush at (707) 845-3873 or Todd Larsen (707) 834-4839 with any questions you may have regarding this event. Sponsorships and auction donations are being accepted now. This entry was posted on Tuesday, August 10th, 2010 at 5:44 pm	and is filed under News, Community, Scene, Environment. You can follow any responses to this entry through the RSS 2.0 feed.